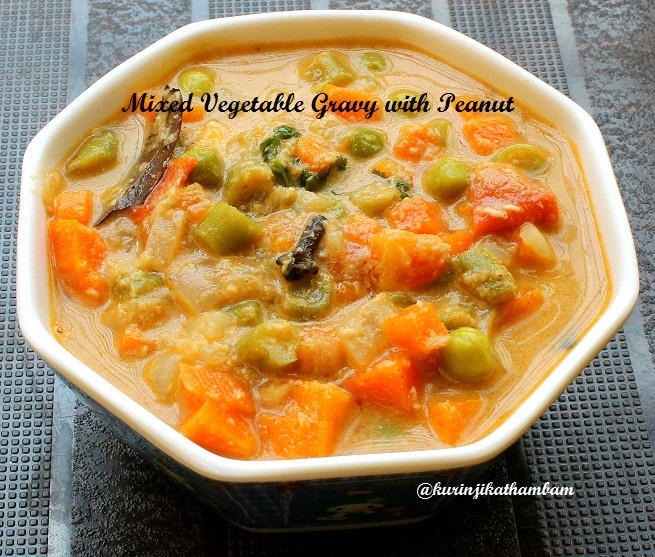 Usually vegetable kuruma is prepared with Roasted gram dal / Pottu kadalai. This variation is using peanuts instead. There is very noticeable and unique taste in this variant also. You can try this once in a while for variety. 1. Wash and peel the skin of the carrot. Cut it into small pieces. 2. Wash and remove the head and tail of the beans. Then cut them into small pieces. 3. Wash the peas and drain the water from it. 4. Grind the coconut with peanuts and fennel seeds, in a mixer grinder, into a smooth paste with litter water. Keep it aside. 5. Remove the skin of the onion. Wash and cut it into small pieces. 6. Wash the tomatoes and cut them into small pieces. 7. Wash and chop the coriander leaves into fine pieces. 1. Heat the oil in a pressure cooker, add bay leaves, cinnamon and cloves. Saute for few seconds. 2. Then add the chopped onion and sauté till they become translucent. 3. Now add the chopped tomatoes and sauté till they become mushy. 4. 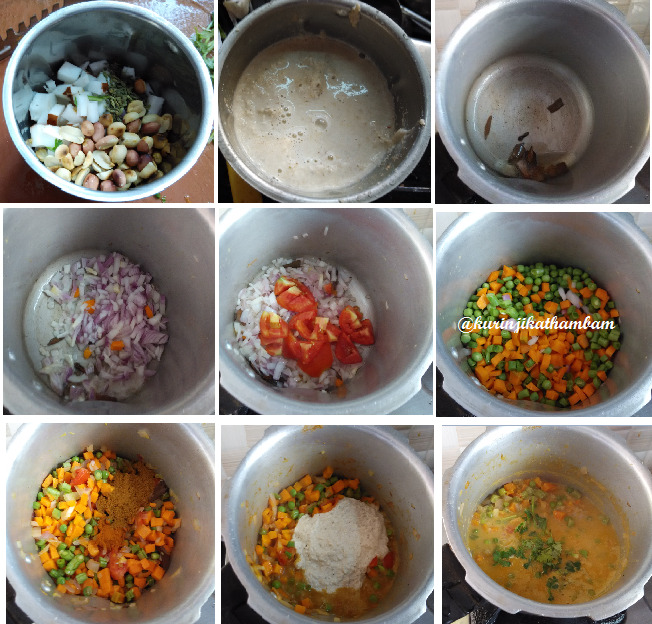 Add the chopped vegetables, peas, red chilli powder, salt and garam masala powder. Mix them well and sauté for a minute. Then add ¾ cup of water and mix them well. 5. Pressure cook for 1 whistle in high flame. Remove the lid of the cooker after the pressure has gone. Now add the ground paste (4 th point in preparation procedure) and mix them well. Cook till the gravy becomes thick. 6. Switch off the flame and garnish with chopped coriander leaves. Immediately transfer it into the serving bowl. This goes well with chapathi, roti and dosas. 1. You can use any type of vegetables. The final vegetable mix I used should be 1½ cup. Ensure that the quantity of vegetable mixture is 11/2 of cup even if the individual vegetables are different. @yummy indian kitchen:Thanks a lot for visiting my blog and for your valuable comment. I added your blog in my blog list dear.